Hayley Williams Is The 21st Century's Pop-Punk Prophet There is no precedent for the Grammy-winning, chart-busting, Hot Topic-surviving Williams, who didn't offer permission so much as show a generation of emo girls they did not have to ask for it. Hayley Williams of Paramore performs onstage in Chicago, Ill. in 2013. Paramore were just kids: In the depths of YouTube, a grainy video montage from 2005's iteration of the mall-punk caravan Warped Tour finds the band green, awkward, at the starting line. That year, Warped featured the first official Shiragirl side-stage for female-fronted acts — instigated by NYC riot grrrl Shira Yevin who, a year prior, had snuck into Warped with her pink RV and planted a guerilla stage, staking out space for women in that perennially male-dominated scene. Paramore, fronted by powerhouse singer Hayley Williams, came from small-town Franklin, Tenn. to Warped via Shiragirl. They had formed only a year before — Williams was 15 — but already you'd never heard someone face the void or holler a "wh-o-oa" with such vigor and aplomb. "No one knew them, and yet everyday they had the biggest crowd," Yevin told me this year, still a bit bemused. In that same Warped video, an intrepid young journalist mentions to Williams that "there's a couple of women on Warped Tour this year — that's different," before inquiring: "Are you glad to be a part of that revolution?" There is no precedent for the Grammy-winning, chart-busting, Hot Topic-surviving Hayley Williams: the brightest pop-punk star, like the Beyoncé of Warped Tour. In the mid-2000s era of swoopy haircuts and studded belts — of sleek, rollercoaster riffs and crashing choruses, when Myspace bulletins were compasses and Alternative Press was gospel — Williams achieved something that most emo girls had no real way to conceptualize. She may as well have invented a color (and, well, she did that, too). Girls were patently not musicians in this scene. That much was clear to Baltimore singer-songwriter Lindsey Jordan, aka Snail Mail, before she attended her first Paramore concert at the age of eight. "Until I saw Paramore, I didn't know girls were allowed in bands," Jordan told Rolling Stone this year. "I remember so clearly having this big moment... I freaked out. That's when I knew I wanted to play in a band." Williams didn't offer permission so much as she showed a generation of girls they did not have to ask for it. Jordan is herself currently electrifying rock with a new hope. 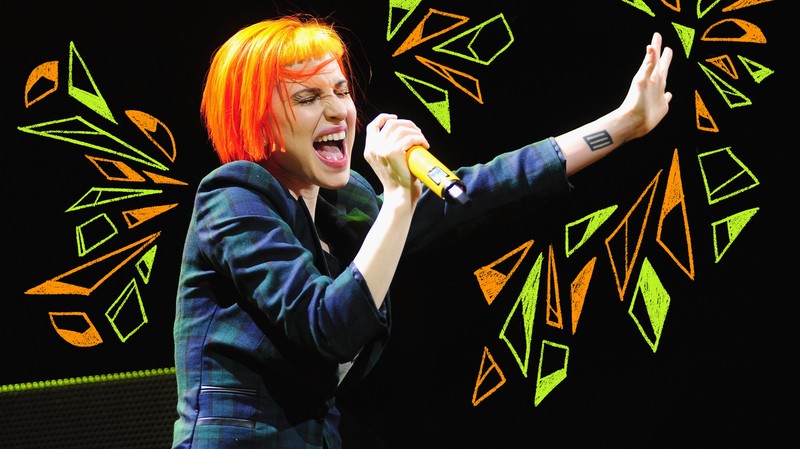 Williams has always been Paramore's great magnet, its spark and its wings. Unlike other pop-punk vocalists, Williams can really sing — soaring and stomping and swinging through a syncopated style of endless words, angst, hopelessness, discontent. From the start, however, she was adamant that Paramore be seen as a band. "I wanted that us-against-the-world thing," Williams has said of her desire to be part of a tribe, to breathe the intoxicating air of camaraderie. Even in corporatized bubblegum mutations, punk subcultures are, for kids, a means of finding fellow outcasts, of feeling less alone. Community is at the heart of that. When Paramore spent 2005 writing on its Livejournal about bands like Mae, Jameson Parker and Underoath, the band was asserting connections with peers. When Paramore covered Sunny Day Real Estate and Jawbreaker, it established a lineage with emo forebears. Those ties are emboldening and life-affirming. Of course, girls have always been crucial fans and consumers of rock — emo and pop-punk included. But for too long, they were denied that highest level of participation: the stage, the mic, the name and face. By insisting to her major label, Atlantic, that she keep her band — not become an Avril-style solo artist, as they would have preferred — Williams carved out a radical new space. She became a center. Moving beyond the slick melodrama of its 2005 debut All We Know Is Falling, its 2007 breakout Riot!, and 2009 victory-lap Brand New Eyes, Paramore is doing its best work today, increasingly leaving that teenaged pop-punk classicism behind. On 2017's After Laughter, Paramore drew further artful embellishments from Talking Heads and Blondie and, with that, completed the classic pivot from punk simplicity towards eclecticism (see: The Clash, Public Image). Taking cues from post-punk, Paramore created post-pop-punk. Its most monumental example of that, and biggest hit to date, is 2013's "Ain't It Fun," which fuses pop, funk, soul, gospel and R&B. The song's aesthetic collage functions like a sonic biography for Williams, who spent her pre-Paramore youth jamming Motown, singing at church and playing in a local funk band that did Chaka Khan and Stevie Wonder. "Ain't It Fun" is a disarming thing to behold, as Williams faces the cold facts of growing up after a whirlwind adolescence in the spotlight. Its lyrics are dizzyingly honest. "You're not the big fish in the pond no more/You are what they're feeding on," Williams sings, sounding like a sage new person. "What are you gonna do/When the world don't orbit around you?" Evidently, you color your existential dread. You make something that's gloriously out of step. The "Ain't It Fun" video finds Paramore smashing guitars and punching records, driving fast in a convertible, screaming, cartwheeling and generally expelling the reckless energy of a band with nothing to lose but the bizarre baggage of its past. "I have been unhappy and I didn't hang it up, and I'm so glad that I didn't," Williams said in a recent interview. "I pushed myself... [and] it's good to see what you're made of. I've been finding that out more recently." Williams has reflected, of late, about how the lack of young women musicians in her scene contributed to loneliness and self-loathing. "I doubted whether people would ever take me seriously," she said. "I felt like I needed to be part of a boy's club to make it. It really affected my sense of self and what I thought I owed people." And so she would go twice as hard as the men she shared stages with. "I thought I had to be better than them to prove my worth," she said. "I wish I'd learned sooner that [being a woman] is actually this incredible strength." Mall-punk was misogynist by design: Boys were centered onstage, girls were consumers, lyrics were for so long sexist and unchecked. Williams herself was no exception. Paramore's unstoppably catchy 2007 single "Misery Business" was one of the smuggest and most spiteful hits of that era. Williams sings bitterly about hating a girl who stole her boyfriend (a "basic b***" by 2010s parlance; a "typical girl" in the '70s), just as she is here taking him back. There is one especially egregious line that critics fixate on, where Williams uses the word "whore," but the toxicity of the song is present in its whole vindictive tone. "Misery Business" is a logical conclusion of third-wave emo's hostile attitude towards women: After years of keeping girls off stages and dehumanizing them in evil lyrics, it finally just pits them against each other. "Misery Business" is proof that no one is safe under patriarchy, which works to put women in competition always. The song — of course — was great for business. It reached No. 26 on the Billboard Hot 100 and was Paramore's biggest hit until "Ain't It Fun." It is almost impossible to imagine being a young fan of 2000s pop-punk and not internalizing some of its misogyny. Williams took the "Misery Business" lyrics from her own diary. As she clarified in a 2017 interview, "I couldn't have known at the time [...] that I was feeding into a lie I'd bought into, just like so many other teenagers and adults before me: the whole 'I'm not like the other girls' thing." Paramore had already started excising the song's most problematic lyric before announcing, earlier this month, that they will step away from playing "Misery Business" live for the foreseeable future. With that, Williams sets another precedent. Artists can change, can admit their faults, can create discourse. They can learn from their pasts and possibly leave them behind. In 2018, though, nothing about Paramore's early sound threatens to disappear completely. Traces of its scene's emotional openness, raw diaristic detail and cleanly-carved hooks can be found across pop's power centers. Producers including Jack Antonoff (formerly of Steel Train, signed to Jersey mall-punk label Drive-Thru Records), Dev Hynes (formerly of Test Icicles, and who later worked with Saddle Creek) and Justin Raisen cut their teeth playing strains of pop-punk. The emo-rap movement has adapted its morose temperament. Even Taylor Swift's writing bares the audible (and stated) influence of Dashboard Confessional. But Williams is the rare artist who has put a pop-punk sensibility on the radio by remaining true to her own clear, reaching voice, without wild reinvention. She has simply evolved, directly and honestly, like the music itself. Williams' influence — particularly among women and people of color — has left a bold mark on the zeitgeist. Grimes cited Paramore as a primary inspiration on 2015's Art Angels and included "That's What You Get" on her list of the Greatest Songs of All Time. As a child, Soccer Mommy's Sophie Allison played the same song at rock camp. Not long after Lil Uzi Vert shared a clip of himself singing "Ain't It Fun," he called Williams the biggest influence on his labyrinthine sense of melody. "She's the best of my generation," he told a radio host. "There's nobody bro." Only recently embraced by more discerning corners of the music-critical establishment, Paramore has resonated with vanguard artists across genres who are unafraid to earnestly think for themselves. The band's fans, willing to seem uncool, have recast definitions of "cool" in the process, bringing Paramore with them. Before the New York City-born-and-bred rapper Princess Nokia played "Misery Business" on a recent Beats1 show dedicated to the pop-punk of her youth, she gave the song, and Williams, an introduction that was especially emotional, as the tone of her voice grew awed and teary. "Girl, you changed my life, girl!" Nokia said of Williams, recounting Paramore's 2010 Bamboozle set and how this band of Tennessee teens took over the music industry, becoming a soundtrack to so many beginnings. Nokia herself brought a missing perspective to the boy's-club of emo rap with her recent mixtape A Girl Cried Red. On Beats1, Nokia unspooled her praise with total rapture: "You came out and you changed everything, girl!" Nokia went on. "You like four feet tall and you got a voice that come from the Baptist church of the South — where you from girl, Tennessee? You definitely from Tennessee, girl! I know you was raised in that church, Miss Honey, Miss Hayley Williams..."
"We gonna have to take a moment and just live for Miss Hayley Williams," Nokia effused. "'Cause she really did that." An earlier version of this story misspelled the name of the band Test Icicles as Test Icles, and incorrectly said the band was signed to Saddle Creek. Dev Hynes worked with Saddle Creek after the band broke up.